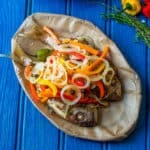 Escovitch fish recipe – traditional Jamaican lightly seasoned and pan fried fish covered with a medley of bell peppers, onions and carrots in a vinaigrette. With Easter just around the corner I thought now would be the most appropriate time to release this Jamaican escovitch fish dish. I’m a huge fan of seafood and as per Jamaican tradition, fish is to be consumed on Good Friday. I grew up in a household where we ate fried or steamed fish on rotation, so hopefully you will this love recipe as much as I do. 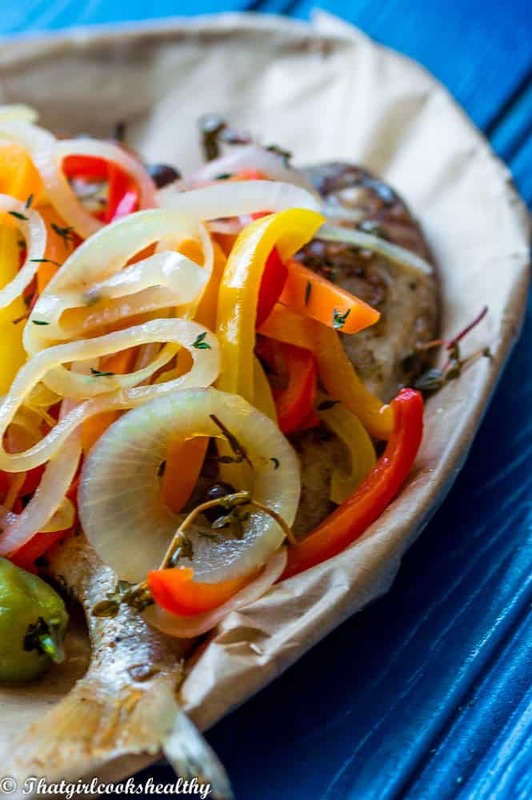 The term escovitch actually derives from the Spanish word pronounced escabeche. 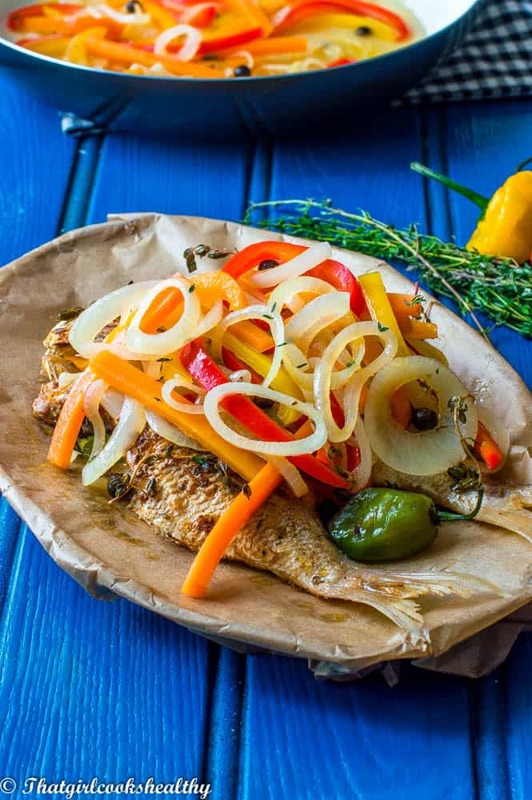 It is a Jamaican cuisine where fish (be it king fish, mullet, snapper, parrot fish – the choice of Jamaican fish) is lightly seasoned with herbs, spices – thyme, pimento, scotch bonnet and pan fried to a crisp. 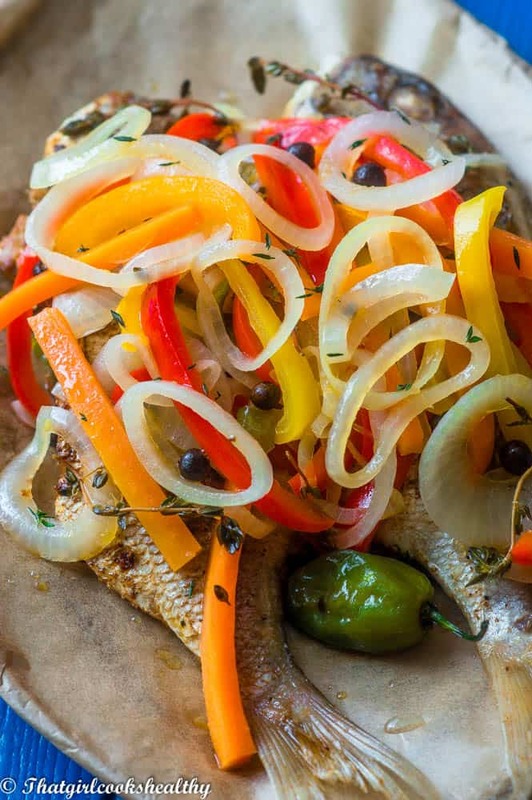 Once the fish is cooked it is served by topping an assortment of pickled vegetables (bell peppers, onions and carrots in vinegar). 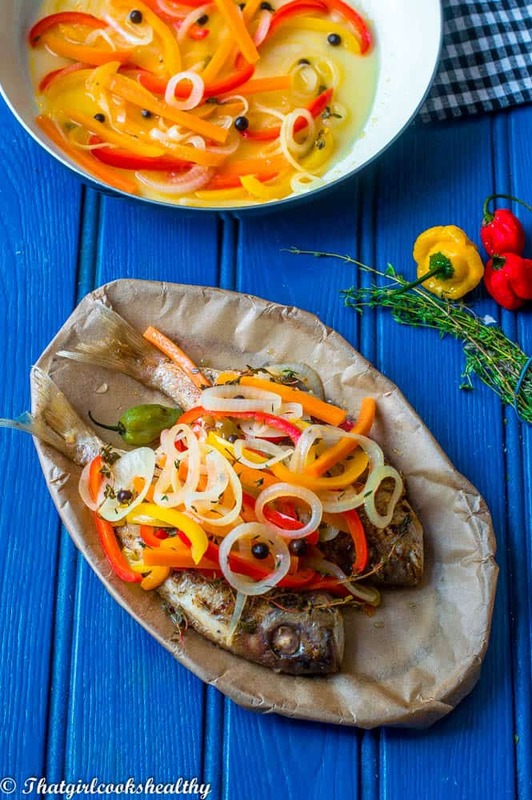 Many islanders like to serve escovitch fish and bammy or even with festival dumpling. For this recipe I would say using 2-4 whole fish of your choice. I used some small whole red snapper!! Rub/rinse the fish exterior and interior with fresh lime to remove the impurities prior to proceeding with seasoning. Seasoning the fish – I used this seafood seasoning and applied it to the cavity of the fish and set aside. You don’t need to infuse the fish with seasoning and leave it overnight. It’s quite alright to apply the dry rub and move onto the next step. It’s totally optional if you want to marinate the fish overnight. I cut some diagonal slits in the fish (not too deep) so the seasoning can be applied with more depth. Cooking the fish – I used a large circumference skillet which holds up to 4 small fish. If required cook in batches so the pan doesn’t overcrowd. Many people use a large amount of oil anything from 1-2 cups which is WAYYYYY too much oil for these little babies. I got away with using 1/3 a cup of coconut oil which has a high smoke point, using my non stick pan with no issues. For a crispy exterior cook the fish on medium heat for 4-5 minutes per side then set aside. Cooking time – the cooking time will vary depending on the size of the fish. I cooked fish that was small in size and thickness which took 5 minutes per side to cook thorough. The same amount of time can be allotted to fish fillets. Large fish – Fish the larger in size with more body/thickness will take long to cook. I would say at least 10 minutes per side. 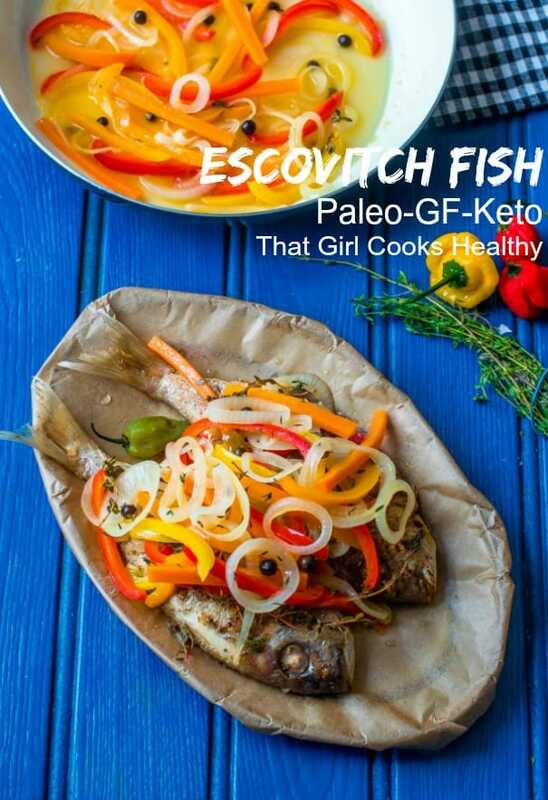 Escovitch sauce – the sauce is what creates the pickling process of the fish, in a sense it cures the fish. This is where you add the remaining ingredients. What I like to do is top up the skillet with more about 1/4 cup of oil just so I know I have enough to saute the vegetables. I then add the bell peppers, carrots and onion first and foremost and saute until translucent. The next step is to add the vinegar, pimento berries (about 10) thyme, coconut sugar – this helps to balance the acidic flavour and scotch bonnet. Chillis – I cut the scotch bonnet up and remove the seeds so there’s flavour, no heat. If you want spiciness/heat simply leave the seeds/membrane in tact. Let the vinaigrette steam the vegetables for about 5 minutes before adding to the fish. Use a knife to diagonally slash both sides of the fish then proceed to coat the fish with seasoning. Add the fish to the skillet and shallow fry until both sides are crispy and brown. Then remove the fish from the pan and proceed to add the bell peppers, onion and carrots and saute until translucent. Add the pimento. thyme and coconut sugar to the skillet and stir. Loving the recipe but wondered if the fish will be fully cooked through after just 4-5 minutes? Hi Loretta. Yes, the cooking instructions were based on using small snapper which wouldn’t take long to cook thorough, providing the oil is heated up before adding to the skillet. I have updated the post to state that larger fish will take longer to cook so there is no confusion.